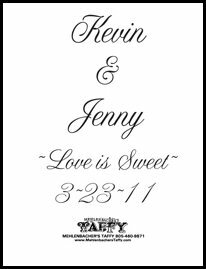 What a wonderful way for guests to enjoy and remember your special day. 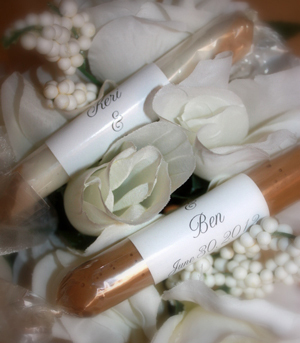 Our high quality hand pulled taffy makes perfect wedding favors. 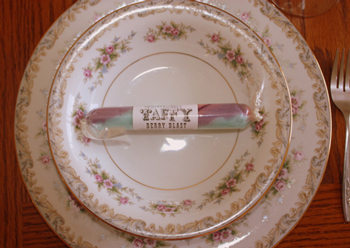 Our taffy was featured in a past June Bridal Issue of Martha Stewart Weddings Magazine... so you know "It's a Good Thing!" Additionally we were in Martha Stewart Living, and in Brides Magazine. Click here to learn more. 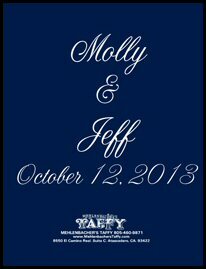 Martha Stewart talks about using Mehlenbacher's Taffy to create a unique wedding experience. We can make custom labels. We require a minimum purchase of 150 taffy sticks, plus a $50 label fee. Custom orders must be received a minimum of 30 days in advance of your required shipping date. Large volume discounts are available.